> Tools>Pliers & Cutters>Stanley Diagonal Cutting Pliers, 5"
Stanley Diagonal Cutting Pliers, 5"
Durable & high quality, these Stanley Diagonal Pliers (Side Cutters) can be used for cutting zip ties, wire, small metal parts, and much more. At 5" long, they are a good mid-sized tool, being large enough for almost anything on your VEX robot and small enough to get into tight spaces. Oil-resistant, 2 component dipped handle offers a comfortable grip. Individually sharpened blades and drop-forged steel make them long lasting! Meets ANSI specifications. 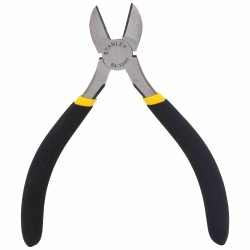 Path: Home > Tools > Pliers & Cutters > Stanley Diagonal Cutting Pliers, 5"